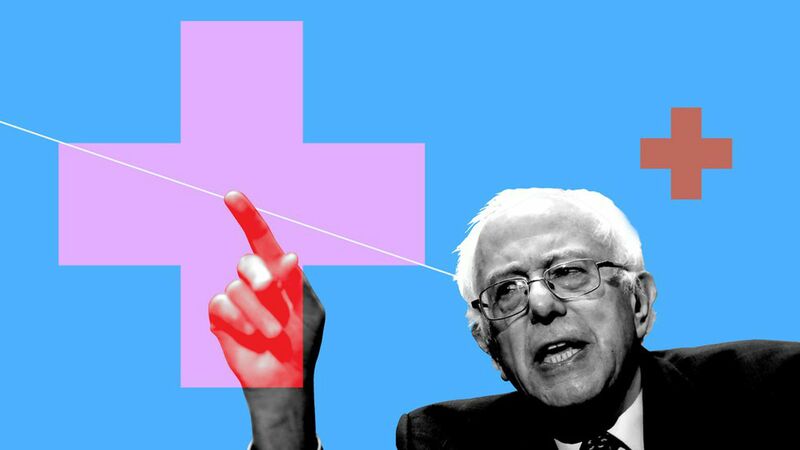 Single payer isn't going anywhere — in either direction. It's not going to pass anytime soon, obviously. But after today, it's also not going away anytime soon. Sen. Bernie Sanders will introduce his "Medicare for All" legislation today and, in addition to Sanders, four more of Democrats' top 2020 prospects — Sens. Cory Booker, Kirsten Gillibrand, Kamala Harris and Elizabeth Warren — have already signed on as cosponsors. The bottom line: Yes, this is a big deal. But if it's time to take single-payer seriously as a political concept, it's also time to start grappling with the policy. Single-payer means different things to different people. But for so many powerful, viable Democrats to endorse just the conceptual idea of single-payer is still a huge political shift. Even if some of them are only doing it because they feel like they have to, that's arguably a bigger change. It wasn't that long ago you had to say you opposed single-payer if you wanted to be taken seriously as a presidential candidate. No one has a clear vision of what “single payer" actually means, and no one other than Sanders cares how Sanders's bill answers those questions. The Democrats cosponsoring Sanders' bill will almost certainly treat it as a political proxy — a broad statement of support for a vaguely defined goal rather than a specific policy endorsement. Where each Democrat ends up could be very different, and could stop far short of true single-payer. Even"Medicare for all" isn't true single-payer. Most Medicare beneficiaries buy private supplemental coverage to fill in gaps the government program doesn't cover. Its drug benefit is largely privately administered. "Whether it's 'Medicare for All,' Medicare buy-in, Medicaid buy in, all-payer, utilizing Medicare as a negotiator — the constant theme will be policies that work constructively and aggressively to leverage the power of the federal government," said Chris Jennings, a veteran Democratic health care strategist. No one — including Sanders — has truly reckoned with how to pay for whatever system they might support. There's still political risk here. Single-payer feels like it has a lot of momentum because so many potential presidential candidates are now supporting it. But Senate Democrats up for reelection next year in red states aren't signing on. Even House Speaker Nancy Pelosi, who has said in the past that she'd love single payer but is also trying to win the House next year, declined to back Sanders' bill and said it's not a litmus test for Democrats. Any form of single payer would require enormous tax increases, and as long as Democrats are in that ballpark, the details are all the same to Republican campaign committees. The bill Sanders is introducing today doesn't just have a long way to go before becoming law. It's not even really on that road. It also has a long way to go before single-payer starts to represent a specific vision, and one that down-ballot Democrats want to entertain. But having Booker, Harris, Gilibrand and Warren all on board is a step in that direction. "As long as the different approaches recognize that they have a common denominator, I think it can be quite effective," Jennings said.